And then… I lost motivation to make anything new. It was a strange feeling. Until tonight. James wanted a fig, prosciutto and goat cheese sandwich this weekend. Unfortunately, we couldn’t find a sandwich shop to make said treat. And so an idea was born. 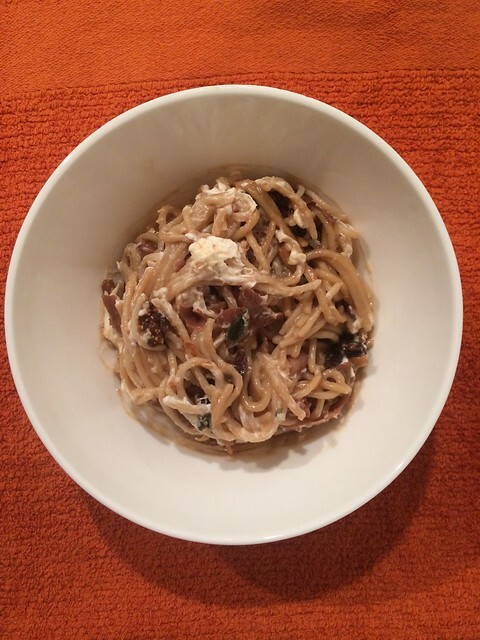 Fig, prosciutto, goat cheese PASTA. And oh my – this was incredible pasta. It was creamy, and well balanced, and delicious. It was entirely made up as I went, and gluten free to boot (though this could be made with any type of pasta with marvelous results). To start, bring salted water to a boil for the pasta. Add pasta and cook according to manufacturer’s instructions. While your water is boiling, thinly slice the onion. Heat 1 – 2 tbsp of olive oil on high in a large frying pan and add onions. Lower heat to medium and cook for 3 – 4 minutes. Sprinkle sugar over onions, stir occasionally for another 1 – 2 minutes. Transfer onions to a separate container. Chop the dried figs into 1/4″ pieces. I removed the stems, sliced in half lengthwise, then chopped across a few times. Heat the pan you cooked the onions in again and add the figs. There should be leftover olive oil in it. Tear prosciutto into the pan with the figs. Occasionally stir in between tearing. After all of the prosciutto is torn up and in the pan, add 2 tbsp of red wine and stir. Lower heat to low. Let wine evaporate (1 – 2 minutes), then add your finely chopped sage. Add the onions back in and stir to combine. At this point, your pasta will most likely be cooked. Strain and add to the pan with your figs. Turn off the heat, and stir to combine everything. Top with crumbled goat cheese. Enjoy!